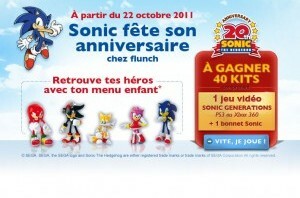 SEGA has partnered with French restaurant Flunch to promote their upcoming game Sonic Generations. From October 22nd to November 27th, you can grab one of five Sonic figurines with the purchase of a kids meal: Sonic, Tails, Knuckles, Amy or Shadow. If you’re a teen or older, you can buy the figurines separately for €3.00 each. Flunch is also holding a contest in each of their restaurants to win a kit consisting of a copy of the PS3 or Xbox 360 version of Sonic Generations (winner’s choice) and a Sonic hat. 40 of these kits are also being given away online. The contest is open to children aged 3-10 years old residing in France, as stated in the terms and conditions. They’re a French restaurant. I’d never heard of them before either. Flunch Hill Zone confirmed for DLC. They have.Those weird Sonic Minigame toys or whatever at Mcdonalds. Do you need to live in in France to enter the contest and if you win a kit, will they ship it to where you live? The rules say entrants must be 3-10 years old and a resident in France. That’s pretty coooooool. They need some america advertising as well. Flunch? What the hell is a Flunch? It sounds like a torture weapon. Has SEGA done anything fun like that here in America? I mean, I know they had Skate the other day and their bulding that park but I wanna be a part of this kind of stuff too! @ Irvin: Yes when they teamed up with Mcdonald’s to promote Sonic 3 by including Sonic toys in their happy meals if anybody remembers that. Don’t forget the Jack in the Box toys in the late 90’s, Denny’s plushes for Sonic Underground, and two Sonic promotions at McDonalds in the early 2000’s. Oh yeah. I forgot about those. Well it wasn’t as fun what’s Flunch is doing but it’s close I guess. I hadn’t heard about such a campaign. Well, the good news is that I will certainly have to stop by a restaurant this week, with that my choice is definitely made. I might be able to buy all 5 at once. WTF does “Flunch” mean? Is it like the “fly-by fruiting” in Mrs. Doubtfire? A flying lunch? Lol. The title of the video says “Sonic’s 20th Birthday at Flunch”. It’s a very loose translation, but I try. The video itself of just basic ad talk, nothing significant for those who are wondering. 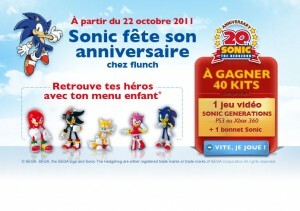 It just says that figures for Generations will be offered at Flunch (presumably celebrating the release of the game). They’re talking WAY too fast for me to translate the whole sentences, but I think I got the gist of it.